Rob Krieger Stone provides bespoke stone masonry for a wide variety of projects. Situated close to Lund and Helsingborg in southern Sweden, with more than 30 years of experience of working with natural stone, we combine traditional masonry techniques with technology to create high quality, carefully crafted stone work to order. Founder Rob Krieger began as an apprentice in Australia and the UK, learning his craft under the mentorship of the master stonemasons of Geoffrey Pike - then London's largest stone masonry company. Under their guidance he began to master skills such as stone cutting, architectural building masonry and sculpting. After many successful years in the UK, Rob moved to Sweden and worked for Skåne's largest stone company prior to starting his own company, Henkelstorp Natursten - now known as Rob Krieger Stone. Our clients include some of the leading architecture, art and design studios in Sweden, as well as private customers and local councils. 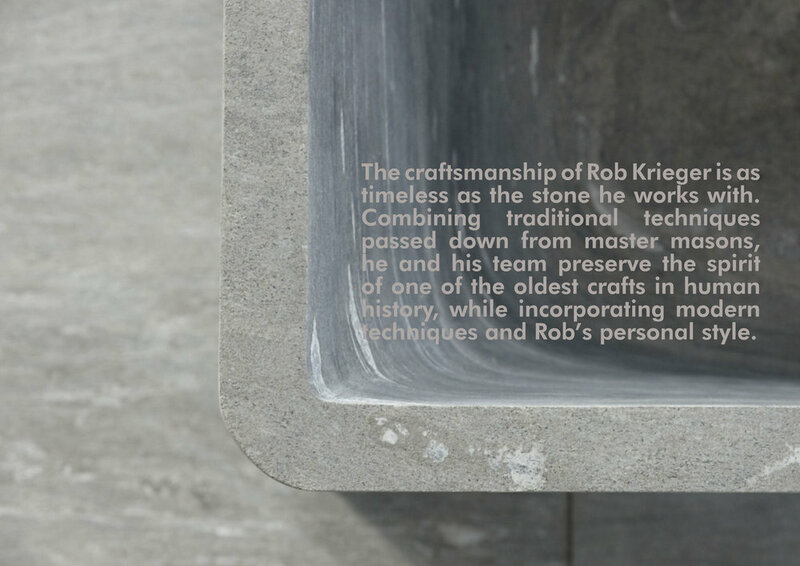 At Rob Krieger Stone, we offer a wide range of services, from sheet cutting, hand carving and bank masonry for small to large projects, to crafting one-off pieces from solid blocks, such as baths and washbasins, using computerised numerical control (CNC) equipment. We also offer a bespoke kitchen worktop service, as well as a full service that includes everything from specialist consultation and advice, to stone sourcing, installation and sealing. In addition to offering a selection of stone in stock, through our network of leading European quarries, we can procure most types of stone. Stone is ordered only after approval of the offer. Offer approval is considered an agreement and cancellation thereafter can incur a cancellation fee. Normal delivery time is approximately 5-10 working days after measuring for stone selected from stock. For stone that is currently out of stock or for special orders, specific delivery dates cannot be guaranteed, as this is the responsibility of the supplier. Stone is delivered untreated, but can be treated with sealant, upon request. Measuring, installation and delivery is available upon request, at an additional cost. Also, if specific vehicles or machines are necessary for delivery and installation, the client is responsible for hire costs. For worktops, service does not include removal of worktops or existing carpentry work and all surfaces must be balanced and ready prior to installation. For advice and information about stone selection, click here.